Prince Harry and Meghan Markle kiss as they leave at St. George's Chapel in Windsor Castle after their wedding. Sir, – Surely not even the most ardent Scottish Nationalist or committed Republican would begrudge the fact that the wedding of Harry and Meghan was a joyous and uplifting pageant watched by millions throughout the world. It represented the best of British traditions, national pride, inclusiveness and style whilst showing the remarkable ability of our Royal Family to adapt and move with the times. There will of course still be detractors who will denigrate Britishness and the privileged position that Harry and Meghan occupy. But what is there to dislike about them? She’s a highly successful, independent, biracial self-made woman who’s found happiness after an unhappy marriage and Prince Harry has married the woman he loves with the blessing of his family. He has seen active service in Afghanistan, which he volunteered for, helped and raised awareness of injured servicemen and acts as a splendid role model for a new generation. Both will continue their humanitarian work, and no doubt very effectively. It is occasions such as this that we can reflect on and be proud of our Britishness which can, as we’ve seen, bring people together in a common endeavour to create a society which we all can enjoy equally. 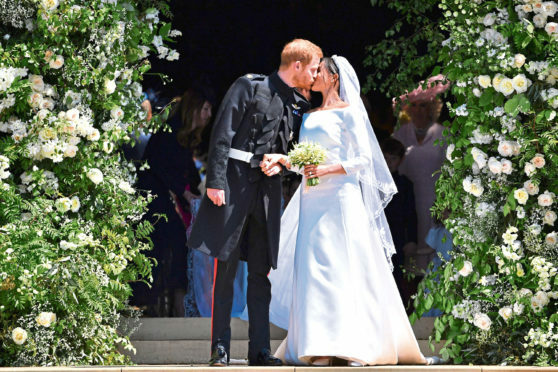 Harry and Meghan’s marriage without doubt marks an historic period for this nation which continues to progress, evolve and be admired worldwide. Sir, – I could not believe my eyes when I read on the front page of The Courier that Angus Council will only cut the grass for Friockheim Primary’s school sports if it is paid £300 for the privilege of doing so. The council’s reasoning for this is that there is no funding available within the ground maintenance budget to do the job.What a lot of tommyrot. Unless I am sadly mistaken I would think that the grass cutting would be carried out by those on the gardening staff as part of their job description who, in any case, are paid for any job they carry out. So can the powers that be please explain how they manage to come up with this additional charge of £300? Surely it is not beyond the ability of the administration to re-schedule the work rota to carry out this job and others like it as and when required and not at any specific time. If, however, the council insists in making this charge perhaps it would be a grand goodwill gesture by our highly paid council officials if they could have a quick whip-round to meet the cost. After all they would no doubt add it to their expenses bill anyway. Sir, – Alex Rowley MSP (The Courier, May 16) is right to call on Fife Council to think again on education cuts, particularly the “rationalisation” of frontline office staff in primary schools which will see many lose long-serving school secretaries. I proposed a motion doing just that at Fife Council earlier this month, but the administration refused point blank to reconsider. Indeed, they said I was being “ridiculous”. How very strange that MSP Mr Rowley apparently forgot his Labour colleagues at Fife Council. After all, they run the council with the SNP and therefore have the power and money to think again on education cuts. Or perhaps he did consult Fife’s Labour councillors and discovered that the “power-sharing agreement” they have with the SNP has left them too weak to do the right thing for schools in Fife. Power would seem to have a stronger attraction to our Labour colleagues than principle. Sir, – The principal of Aberdeen University, Sir Ian Diamond, has told a Holyrood inquiry that his admissions department is forced to reject applications from well- qualified Scots because of the SNP’s quota on places. It transpires from figures disclosed to a national newspaper under the Freedom of Information Act that 2,816 Scots have been accepted to medical schools at Edinburgh, Glasgow, Aberdeen, St Andrews and Dundee universities in the past five years. Meanwhile, 13,896 suitably qualified Scots applicants had their applications rejected. This is another example of the myth of free tuition for Scots. It is not only in medicine that Scots are missing out as a look at graduation lists of the aforementioned universities shows. In all the major subjects – such as medicine, science and engineering – the vast majority of graduates are from outwith Scotland and the EU. These mainly Asian and African students pay the large fees required to fund “free” tuition for Scots and EU students. The numbers of Scots going to universities, which the SNP claims is increasing, are mainly going to the “B-string” of universities offering subjects from nail technology to hairdressing and media studies. By perpetuating this false premise of free tuition the SNP are educating the rest of the world’s students at the expense of Scottish students and the future of the country. In the face of a chronic shortage of GPs, scientists and engineers in Scotland the SNP’s ideological obsession with free tuition is unaffordable, a betrayal of Scottish students and totally irresponsible. Sir, – At the time of the independence referendum in 2014 the people of Scotland were assured of our importance to the UK, the huge contribution we made, and how much we were loved. In response 43% said it would be, 22% didn’t know, and only 35% felt that it wouldn’t worth it. So 65% of those English people polled would either be happy for Scotland to be dumped, or didn’t mind one way or the other. It was even worse for Brexit sticking point Northern Ireland with 69% of English people polled saying that they would happy to be shot of them, or weren’t bothered either way. So much for the “United” Kingdom. Sir, –So Ms Sturgeon and the SNP want to start up a divisive Indyref again. What strikes me here is the total lack of understanding of democracy. In 2014 the people of Scotland said no to independence in a democratic decision taken by the people of Scotland. In 2016 the result from the Brexit referendum was clear, the people of the United Kingdom had democratically chosen to step out of the EU. The SNP and Ms Sturgeon cannot accept that the people of the UK chose democratically, just because it was against their wishes. What is odd is the fact that Ms Sturgeon/the SNP are against the rules from Westminster, but want to submit to the far more complicated and more difficult rules from the EU. And now, again, they speak of Indyref 2. Independence for Scotland means our own air force, army and navy and NHS, currency etc. This all costs a lot of money that the taxpayers of Scotland would have to bring in. There are not enough jobs in Scotland, the people of Scotland will not be able to pay the tax to afford this and oil will not bring the riches any more. Isn’t it about time that Ms Sturgeon and the SNP learn to deal with the fact that they will be appreciated more by stopping talk of this total nonsense of independence and accepting the will and the choices of the people? Only then will Ms Sturgeon and the SNP have the right to speak about democratic choices. Don’t get me wrong, I live in Scotland, I love Scotland and I want the best for Scotland, and that will be achieved by staying within the UK.